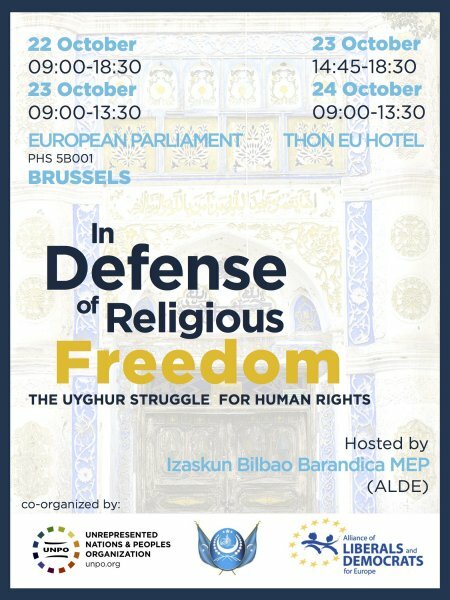 In light of the progressively alarming human rights situation in the People’s Republic of China (PRC), World Uyghur Congress (WUC), in cooperation with the Unrepresented Nations and Peoples Organization (UNPO), and sponsored by the Alliance of Liberals and Democrats for Europe Group (ALDE), is convening a three-day conference entitled “In Defense of Religious Freedom: The Uyghur Struggle for Human Rights’’. The conference will be hosted by Izaskun Bilbao Barandica MEP (ALDE) and will be held at the European Parliament in Brussels, room PHS 5B001, on the 22 October 2015 from 09:00 to 18:30 and on the 23 October 2015 from 09:00 to 13:30. Still on the 23 October 2015 the Conference continues at the Thon EU Hotel from 14:45 to 18:30, and on the 24 October 2015 from 08h30 to 14:30. The conference will bring together policy makers, academic experts, human rights activists and community representatives to discuss the upsurge in anti-minority policies and human rights abuses, particularly the systematic stifling of religious freedom, interlinked with a sharp rise in political insecurity and tensions. Although freedom of religious belief is enshrined in PRC’s constitution, Chinese authorities consider religious diversity as a threat to the country’s stability, and as a result, an autocratic monopoly over the freedom of religion is being implemented. However, the government’s imposed regulations and limitations on Islamic practices have evidently fostered inter-ethnic tensions and resentment. Experts will shed light on the predicament of Uyghur Muslims as a religious group in the East Turkestan region (Xinjiang province), who often find themselves increasingly under the pressure of oppressive laws, constraining double standards and systematic assimilation policies drawn up by the central government in pursuit of mono-culturalism. China’s current governing system deliberately falls short of providing sufficient protection to vulnerable religious groups and addressing social and political volatility. Moreover, the Chinese authorities have successfully isolated religious groups, in particular the Uyghur Muslims, from international solidarity, falsely legitimizing the crippling of religious freedom as a geopolitical concern. The conference will be conducted in English, Arabic, Turkish and Uyghur. Click here to check the full program of the conference. Click here to check the Speakers Biographies.